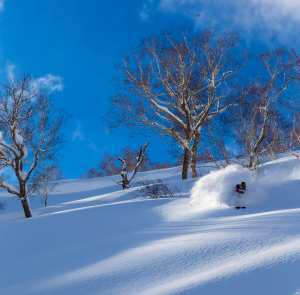 Japan powder is a snowboarder’s heaven – deep, light and available in abundance. Does that still exist in? Hokkaido and Nagano are the obvious choices, but for me it was time to try something different. Niigata, on the island of Honshu, has always looked enticing and a road trip through there promised new mountains, fewer “Gaijin” (Japanese for “white person”) and a sense of adventure and discovery. We found plenty of deep snow empty mountains and the best Saki in Japan. The quirky culture of Japan is one of the best things about traveling there. Escaping the futuristic madness of Tokyo, we hit our first hurdle when we stepped off the shinkansen (bullet train) in Nagano city. Snow was falling heavily on the platforms and deep banks of it were visible just outside the station. Looking for our connecting train, we asked a railway attendant for directions. “Sorry… no train to Myoko. there is too much snow”. This is the sort of transport hiccup that you expect in third world nations, or even the hopeless UK, but in Japan? When essential services like the trains grind to a halt, the snow must be serious. It only made us more determined to get to the mountains. Faced with spending a frustrating night in Nagano, we made a few calls and got ourselves sorted. We hopped a train as far as we could, and the kind Amy from the Myoko tourist board picked us up from the nearest functioning station. She arrived like a miniature superhero, resplendent in her fur lined boots and purple jacket, and full of information about the storm battering the region. Bicycles are so popular in Japan that they have parking lots at train stations that would rival your local mall. As we drove north, huge embankments of snow towered on the sides of the road. Crossing the bridge that marks the Nagano-Niigata boundary, Amy explained that *Niigata’s closeness to the Japan Sea means it gets hit with more snow than other areas of Honshu. * Ahead of us, the snowplows are tunneling more than ‘plowing’ producing 10-15ft high walls of snow lining the road. The news reports were calling some of the heaviest snowfalls in the last 20 years. “Epic” would be a safe way to describe the conditions. With a few days riding the Myoko resorts under our belt, the plan was to keep on heading north. 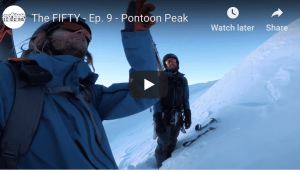 We had a bunch of places we wanted to check out, and conditions were good everywhere. But with a handful of great resorts, barely anyone around and plenty more snow forecast, leaving Myoko didn’t seem like much of an option. 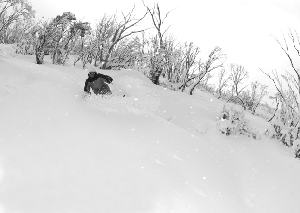 Myoko was delivering the goods and the other spots on our list would have to wait. The road trip was derailed before it’d even gotten into full swing. The only thing that is busy in Myoko Kogen is the snow as it keeps busy piling higher. Snowboarding Japanese powder is a near spiritual experience and is a ‘must do’ for any snowboarder of any level. Akakura is main area in Myoko, with plenty of accommodation and places to find a feed. It’s actually two connected resorts, but you can safely focus your attention on the trees, steeps and burly terrain of Akakura Kanko . Suginohara is the next largest resort, boasting a couple of fast lifts and some long runs. Ikenotaira makes up the third. It’s a small hill, not offering much in the way of freeriding, but it’s got a big park with a ton of rails, jibs, and some medium size kickers. Even better, a bright yellow Kombi sets up in the carpark and pumps out reggae tunes and Japanese style kebabs. And if you’ve got access to a car, nearby Seki Onsen is a short drive away. It’s a clunky old resort with a couple of slow lifts. There’s pretty much no infrastructure, but… they don’t groom. 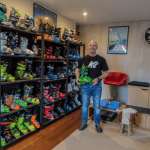 So time it right and you’re in freeride heaven. Japanese resorts have great tree riding with perfectly spaced trees, although be careful, as in some places off-piste riding is strictly forbidden and you can loose your lift ticket if caught. Myoko Kogen has a great array of terrain parks for people looking for some air between the pow. This region is the home to families of wild monkeys you’ll see in trees and in the hot thermal pools. Every second house in the town of Myoko seems to have a bobcat or an oversized snowblower to fight the endless battle with the falling snow, struggling to keep the town from being swallowed. The snow is banked so high in parts of the village that a series of maze like tunnels have been cleared to people’s homes, and they resemble strange modern day igloos. The food is always going to rate high on any Japan trip, and in addition to the usual tasty fare on offer, every region boasts some specialties. Straddling the Nagano-Niigata border, Myoko seems unsure what to call as their own so they hedge their bets and offer up the soba noodles of Nagano and the sake of Niigata. There’re many restaurants serving their own special soba, as well as a Myoko-style udon with local mountain vegetables. And of course, the locals are more than keen to join you in downing a gigantic bottle of sake. Get stuck into it, because Japan’s best sake is brewed right here in Myoko. There is one other local dish, but raw horsemeat probably isn’t to everyone’s taste. Word to the wise – if you prefer your horses running round a field, avoid the basashi. At the moment Myoko is a bit of a hidden gem. We weren’t sure what to expect, but we stumbled across a place so good we put our travel plans on ice. 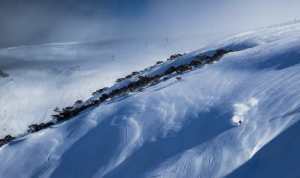 There’s a down to earth friendliness in the town and on the hill, and the resorts offer some unreal riding. No doubt it’s going to be a popular area in the future. An influx of tourist dollars into the town will be welcome, but locals also are also wary of sudden development. The village is keeping an eye on the booms of Niseko and Hakuba, and are keen for something more moderate and controlled. For now, it’s the sort of place you want to keep to yourself. Myoko is always going to get a lot of snow. Let’s hope it keeps its small-town vibe. Ah – Asahi one of Japan’s finest brew’s. The Japanese take convenience to the next level. On mountain vending machines offer a variety of snacks from hot coffee to noodles. Monkey’s fill the hot thermal baths around Niigata area and its a popular destination for Japanese and Australian toursists.